Scientists generally believe that river floodplains are built as stacks of regular layers: As rain or snowmelt from mountains drains into lowland rivers, the resulting floods deposit thin layers of sediment. Although geoscientists have found no obvious natural law that dictates how often and by what means a river should flood, researchers studying floodplains in northern Bolivia expected to find thin, regular, datable layers. But when they examined sediment cores from the pristine systems in the Amazon basin, they realized most of those layers were missing  years of layers, actually. And the sediment layers that were there were very thick. The sediment transport system was completely different from what they had hypothesized. The Mamoré River winds through the Bolivian Andes before reaching a vast foreland basin where the floodplain is expansive. Courtesy of Rolf Aalto. 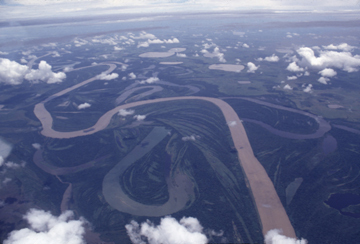 The Beni and Mamoré river basins comprise 720,000 square kilometers of the Amazon basin. The Beni drains 70,000 square kilometers of the Bolivian Andes and an additional 50,000 square kilometers of densely forested, isolated and pristine floodplain. The Mamoré drains 600,000 square kilometers of the mountains and the foreland basin, both of which are largely unchanged by people. As reported in the Oct. 2 Nature, Aaltos international team collected 276 cores, 65 to 160 centimeters deep, at transect distances of 50 to 3,000 meters from the channels, predominantly from the higher, more mature floodplains. In studying the lead-210 isotopic activity profiles of a subset of cores, they developed a flexible new methodology for floodplain geochronology. The geologists found that the sediment stratigraphy is dominated by 20- to 80-centimeter thick discrete sediment packages. They eventually started seeing similar signals in cores across the floodplains, Aalto says. The isotopic profiles suggested system-wide recurrence intervals of eight years, with complete voids in time between each thick sediment layer. To solve this temporal mystery, Aaltos team turned to ocean temperature and stream flow records. They linked the floodplain depositional layers to rapidly rising floods that occur during La Niña events in Bolivia. Rather than corresponding to annual flooding events in the rainforests, each large sediment influx corresponded to a La Niña event in the historic record, according to the research, funded by the National Science Foundation and NASA. La Niña  the cold phase of the El Niño/Southern Oscillation cycle (ENSO)  drops excessive amounts of rain on the Andes roughly every eight years. When those heavy rains hit, they trigger great floods that wash vast amounts of sediment out of the mountains and into a huge foreland basin. 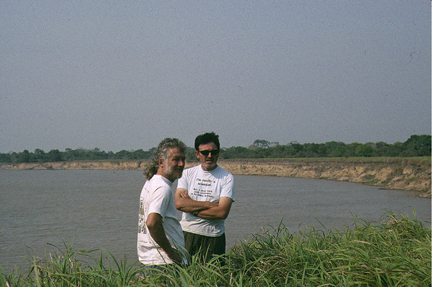 Geologists Tom Dunne and Pascal Fraizy stand along the Mamoré in Bolivia. The cut-bank in the background shows the side of the river where the geologists took the majority of their samples in studying floodplain deposition. During annual flooding events, water collects and rises on the floodplain as fast as in the river channel. The sediment-free water that pools on the floodplain  often described as black water  provides a balancing pressure that pushes back on the channel water, so the channel water and its sediment load stay within the channel. The prevalence of such black water thus inhibits diffuse or local over-bank transport of sediment, or crevasse formation, and subsequent sediment deposition in non-La Niña years. Only a rapidly rising flood can engender the critical elevation differential between water in the channel and in the floodplain required to form crevasses, Aalto says. The large, rapid-rise floods triggered by ENSO form crevasse splays that account for these episodic depository layers. During La Niña events in Bolivia, storm rainfall is significantly heavier in the mountains than on the floodplain, so the water in the river channel rises much faster than water on the floodplain. The notion that the controlling variable for floodplain deposition is the speed of the rising flood rather than its size is a new and different explanation for this phenomenon, Paola says. Aalto and colleagues connect floodplain sedimentation and buildup to the ENSO cycle in a way that has never been done before. That connection, he says, has ramifications for the creation of floodplains and then the subsequent storage of sediments worldwide. Aalto believes that the processes guiding the Beni and Mamoré might be part of the general mechanics of large river systems. Unfortunately, he says, of the hundreds of large river systems worldwide, only a handful still function naturally. Aalto wants to better understand how rivers behave in natural conditions and to apply the lessons learned to the management and restoration of anthropogenically disturbed large river systems such as the Mississippi, the Missouri and the Sacramento. Geologists, he says, need to study the science behind continental-scale river systems, as they are natural distributors of most everything across continents.